A big welcome to the lovely Rachel from Sun Scholars! A lovely blog that I have been following for quite some time! 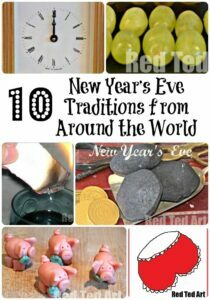 As Rachel is currently living in China, I thought it would be lovely to have a wonderful guest post about Chinese New Year as part of the “New Year’s Eve” Tradition series. Great for now and great for the Chinese New Year itself. Over to Rachel. Hi, I am Rachel from Sun Scholars… and I can’t tell you how excited I am to be sharing at Red Ted Art today! 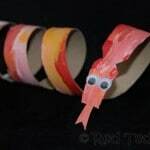 This is one of my most favorite places on the web for fun and crafty ideas for the kids, so I am honored to be here. My family is living in China as expats for a few years, and when I have time, I share a bit about that along with my own craftiness over at my blog, SunScholars. 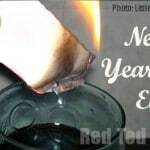 Today, I’m sharing with you a special, Chinese tradition for the New Year. For the Chinese, the Chinese New Year is the greatest celebration of the year. Because the Chinese follow the lunar calendar, the Chinese New Year falls sometime in January or February, and not on January 1st as we would recognize it. For 2013, the Chinese New Year is on February 10th. It marks the coming of spring even though many parts of China are still VERY cold at that time. Their actions and intentions all hold great significance in welcoming prosperity, happiness, and good fortune for the year ahead. The Chinese New Year holds many special traditions. One of those is the red envelope. Unlike our Christmas where we exchange various gifts, the Chinese give money. You don’t see people flocking to the stores for their Chinese New Year shopping… only to purchase a new outfit. New clothing is always worn for Chinese New Year as an important symbol for starting anew. 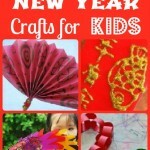 Even the children are given gifts of money in the Chinese New Year rather than toys. This money is ALWAYS given in a red envelope with gold lettering. 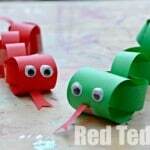 This is a red envelope that would be given to a child. The children’s envelopes will sometimes include cartoon characters, such as this one. For the Chinese New Year, it is also common for people to keep a pocket with these envelopes containing money to give to children they might pass during the day. The money placed inside is also very significant! You only place nice, crisp bills inside and never coins. You would never include a value with a ‘4’, such as $40, or $140, because in Chinese the pronunciation of ‘4’ is the same as the pronunciation (homophone) of ‘death’. For the same reason, ‘6’ is good for business, and ‘8’ is the best of all. An ‘8’ in Chinese sounds like the word ‘prosper’, and ’88’ means ‘double happiness’. A gift of $88 would be much more appreciated than a gift of $100, because of the meaning behind it! 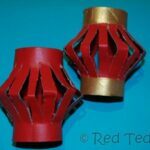 So I’ve put together a simple little tutorial so you can make your own red envelope in celebration of the coming Chinese New Year! 1. Measure your bill! I just happen to have a purse full of Chinese Yuan, but you likely do not… so I am not giving you my measurements. Add 1/4″ to your length and width measurements. I used a cup to trace the rounded edges for the flaps. 3. 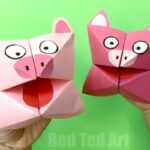 Fold and glue! Fold along the dotted lines as shown in the template image in Step 2. Add your glue to the top of the small side flap and the bottom flap so you can form your envelope by gluing the back flap into place. Once you’ve got the envelope formed, make sure your money fits inside! Fold the back flap down and use a pencil to draw where the flap ends on the back of the envelope, like in the image below. Open the flap and draw a semicircle up from the line you drew. This is the line you will use an exacto knife to carefully cut to form a flap to close your envelope. We tucked the corner of a cutting board into the end of the envelope so we didn’t cut through to the front of our envelope. Carefully cut along the semi-circle. Erase your pencil markings, and test out the closure. You should be able to secure the top flap closed by tucking it into your cut semi-circle like you see below. 5. Add Some Good Luck! 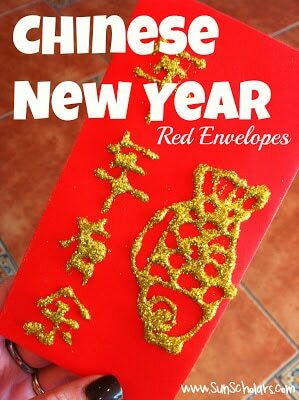 All red envelopes have gold lettering wishing happiness, luck, or prosperity for the recipient. The fish is a very important symbol for the Chinese New Year because it is also a homophone for the word ‘wealth’ in Chinese. Red is always used because it also represents good luck. I asked my Ayi what is common to find written on red envelopes for the Chinese New Year. She gave me this. The first two characters mean ‘year, year’ and repeated mean ‘every year’, the third means ‘to have’, and the last means ‘wealth’… or in the case of the character below, ‘gold’. The last character that I have drawn on my envelope is the one my ayi gave me… close to the one below, but not exactly. The character drawn last on my envelope is a homophone for ‘fish’ but means ‘wealth’. I wrote these in pencil on the envelope and drew a picture of a fish to then cover with gold glitter. Here is the finished envelope! Ready to fill with money and pass onto someone special for the Chinese New Year! Thank you so much Rachel for sharing your wonderful tutorial and crafty session for us! I do hope you stop by at SunScholars and check out Rachel’s wonderful blog! In the mean time – Happy New Year!! Maggy, thank you so much for having me!!! 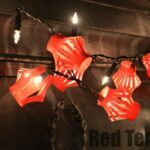 Thrilled to be sharing at Red Ted Art! xoxo Hope you and your family had a wonderful Christmas… and Happy New Year!!! My pleasure Rachel!! A pleasure to have you!! What a lovely post. I really enjoyed learning more about the little red envelopes. Thanks to Rachel for this. It is a lovely post, isn’t it?